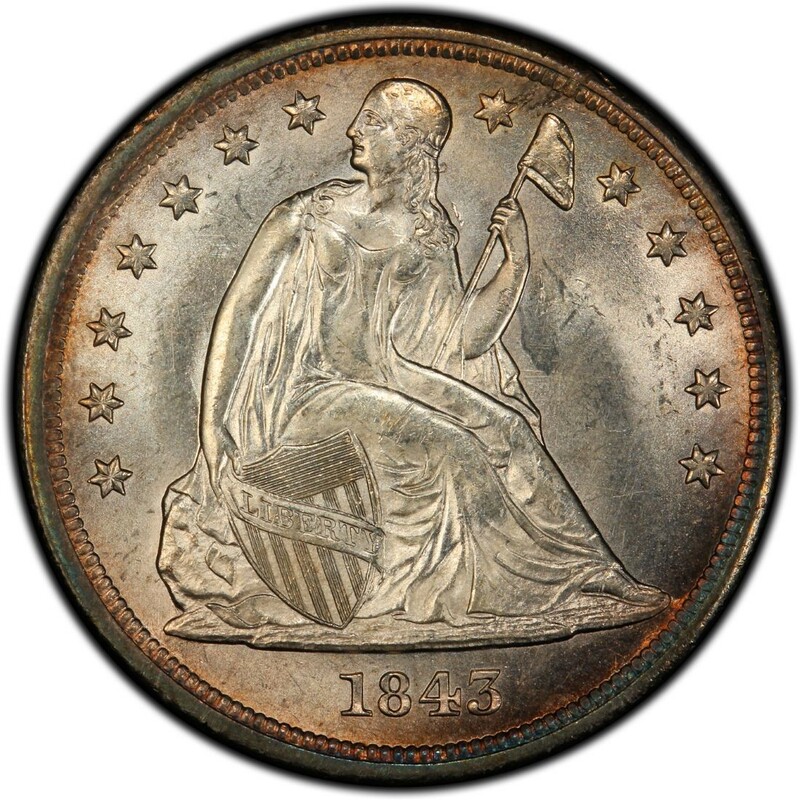 1843 Liberty Seated dollars are scarce silver coins that are most often pursued by U.S. type collectors who build sets of 19th-century coins. Seated Liberty silver dollars are coins that bear the Liberty Seated obverse shared with most other silver U.S. denominations of the mid- through late-19th century. Liberty Seated silver dollars were designed by Christian Gobrecht, who was the Chief Engraver of the United States Mint at the time. He also designed the other Liberty Seated silver coins struck during that era. Liberty Seated silver dollars were made from 1840 through 1873 and were struck at four of the then-operating mints, including those in Philadelphia, New Orleans, San Francisco, and Carson City. Liberty Seated silver dollars circulated well during the 1840s through much of the 1850s, but as silver bullion prices rose as the 1850s rolled on, the coins were relegated to foreign trade use. 1843 Liberty Seated dollars were made only at the Philadelphia Mint, where 165,100 pieces were struck. While this number may seem large to some collectors, it is important to bear in mind that most Liberty Seated dollars were melted for their silver content or otherwise lost in the sands of time. Today, only a fraction of that number survives, and most are in poor condition. Many have been cleaned, holed, or otherwise altered beyond their original state. 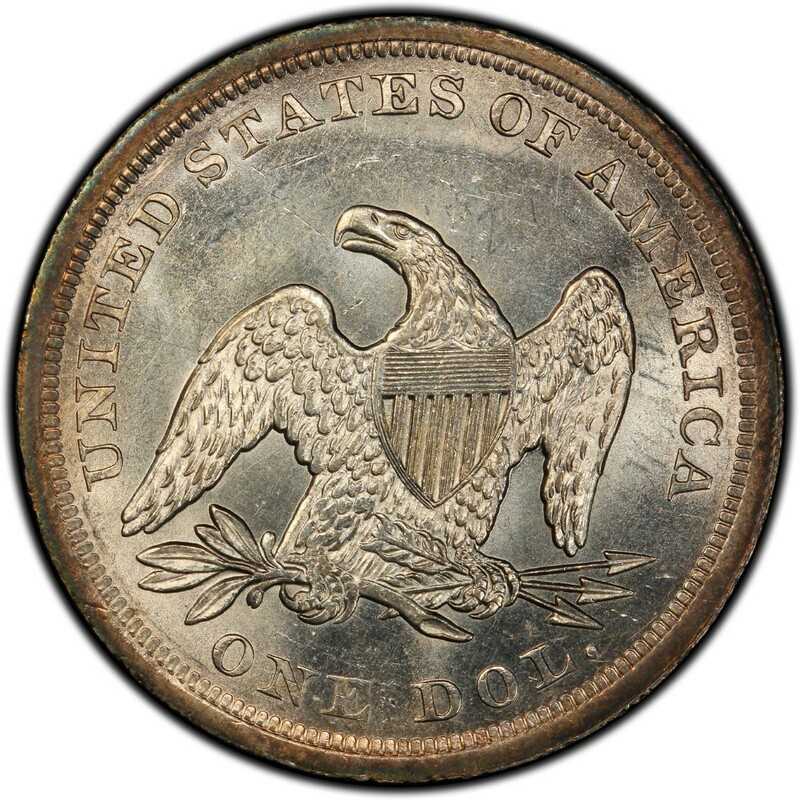 The value of an 1843 Liberty Seated dollar starts at around $300 for a piece grading Very Good-8 and increases up to $2,600 or more for an uncirculated specimen. Proofs are valued at around $35,000 and up. 1843 Liberty Seated dollars are made from a composition consisting of 90 percent silver and 10 percent copper, and each coin contains 0.77344 ounces of pure silver. Measuring 38.1 millimeters in diameter and weighing in at 26.73 grams, Liberty Seated dollars are as large and heavy as Morgan and Peace silver dollars.